This exhibition is something of a retrospective showing some of the work I have done over the last twenty-five years or so. Within those years, however, there was more than a decade when I had given up painting all together. 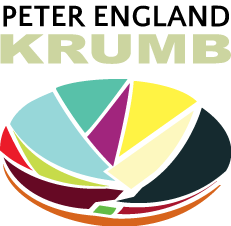 It was a time when I concentrated on more commercial activities including working in a design consultancy in London and more recently working on my own doing graphic and website design under the name of Krumb Design. So this exhibition is a great opportunity for me to see some of the work hung together for the first time, showing how the work has developed and some of the recurring themes. I lived for a while near Port Meadow in Oxford and would spend time watching the river. Later while living in London I painted the Scraps series when I thought about the river and what was left behind particularly after flooding. I seem to remember thinking about washing on the line too. I wanted to give each snagged fragment a different personality, I can’t quite remember what these two were meant to be! The stripped paintings took me in a different direction as I became more interested in the surface of the paint itself. Sometimes using paint on top of already wet paint, sometimes laying paint over often complimentary colours to create different effects. 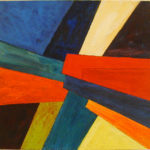 Then working backwards and forwards across the surface placing different stripes together letting chance send the painting in unexpected directions. I first came to know about about Calabash in around 1990 when I was lucky enough to visit Sierra Leone where my sister was doing VSO – it was a fantastic and eye opening trip. When I was there she pointed out the Calabash bowls made from the fruit of the Calabash Tree (Crescentia Cujete) originally a native of South America. They seemed to be used for everything, for bailing out boats, carrying liquids, as drinking vessels, even for the sounding boxes of musical instruments…. and sometimes they were highly decorated with marvelous designs burnt into the surface with a hot knife. I thought I might try my own decorative effects, so when my sister returned to Oxford she brought some Calabash with her, I painted the inside and exhibited them in The Oxford Gallery on the High Street. And it was the Calabash which finally ended my painting drought when years later I was commissioned to paint some more. 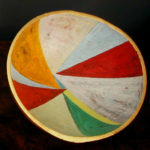 I returned initially with the stripes idea I had been working on before I stopped painting then moved on to the triangular shapes which created a misaligned tension in the middle which only revealed itself as you peered over the rim of the bowl into the centre. I showed these and other more recent paintings during Oxford Artweeks in 2013. The paintings I have been working on this year are shown here for the first time. They build on the ideas I was developing with the Calabash while also returning to the idea of interlocking field shapes. These are again imagined as if being seen from above- with the horizontal shapes almost like a river running across the picture with a weir or bridge crossing point in the middle, evoking memories of walks in Oxfordshire, crossing and recrossing rivers and streams. And also, for me, the night pictures of Samuel Palmer.